This summer, discover the undiscovered. REGISTRATION Now OPEN – Book TODAY! 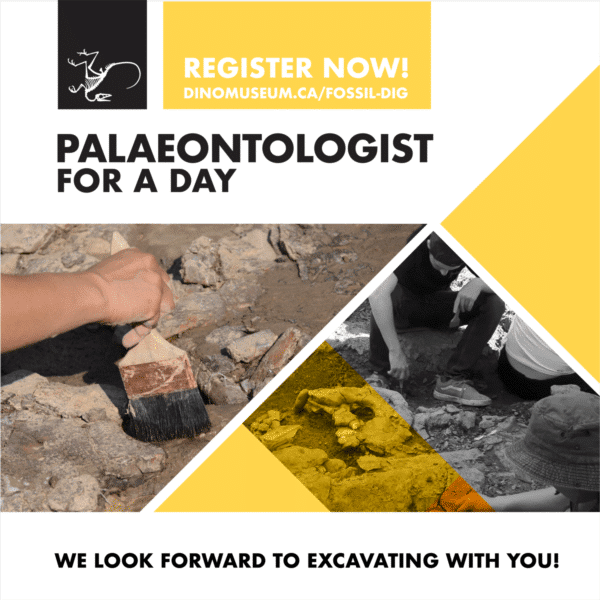 What lies buried just under the surface?In our Palaeontologist for a Day program, you will join a real palaeontological excavation this summer and find out for yourself! Go shoulder-to-shoulder with researchers and field crews as we explore the Pipestone Creek bonebed for dinosaurs, and with them, the answers to what was really happening right here millions of years ago!As one of the densest fossil sites in the world, Pipestone Creek is a treasure trove of prehistoric information, but there is still much we don’t know. Each new fossil uncovered provides another piece of the puzzle, and enhances our understanding of the enigmatic animals that once made their homes here. As a part of the excavation team, you’ll start your day with a behind-the-scenes tour of the museum. Following the tour, you’ll be transported to the bonebed with the other dinosaur hunters, get equipped with a museum tote bag, water bottle, and real fossil hunting tools, then set about scouring the bonebed for the next big discovery with the assistance of our palaeontology team. There will also be time to take a break, breathe in the serene landscape, and have lunch hand-packed by our catering team.When the day is done, you’ll be taken back to the museum to relax with a hearty dinner in our restaurant and share what you discovered with the other participants. • Participants must be at least 14 years of age, and those under the age of 16 must be accompanied by a parent or guardian.• As the Palaeontologist for a Day program is an outdoor physical activity, there is some inherent risk. Participants will be outside for most of the day. Drinking water will be provided by the museum, but participants must bring their own weather-appropriate attire, including sunscreen.• Palaeontologist for a Day programs will proceed rain or shine. Cancellations will only occur in the event of extreme or dangerous weather conditions.• When booking multiple dates, please go to https://bookeo.com/pjcdinomuseum/prepaid before you book, and get a pre-paid package that you can use for 2, 3, or 4 different dates at a reduced rate. These package credits will be used during your booking. Note that sign-in is required to use pre-paid package credits, and bookings with pre-paid package credits can only be made for one person at a time.